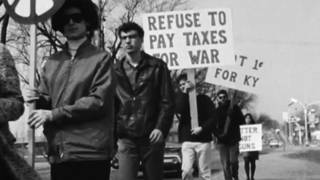 50 Years Ago Today: Catonsville 9 Burned Draft Papers with Homemade Napalm to Protest Vietnam War | Democracy Now! Fifty years ago today, on May 17, 1968, in the Baltimore suburb of Catonsville, Maryland, a group of Catholic priests and activists stood around a small fire, praying and singing. They had gone into the local draft board office and taken 378 draft records, for the young men in the 1-A category who were most likely to get drafted to go to war in Vietnam. They set fire to the draft records using homemade napalm, made from gasoline and laundry soap, to symbolize the U.S. military’s use of napalm on Vietnamese civilians. Video of the act of civil disobedience was seen around the world. They became known as the Catonsville Nine, and in 1970 they were given prison sentences of up to three years behind bars. We feature interviews with Fathers Phil and Daniel Berrigan, who helped organize the protest, and speak to Margarita Melville, one of the last surviving members of the Catonsville Nine, during a ceremony to mark the unveiling of a new historical marker to commemorate the action. AMY GOODMAN: This is Democracy Now! I’m Amy Goodman. Fifty years ago today, on May 17, 1968, in the Baltimore suburb of Catonsville, Maryland, a group of Catholic priests and laypeople stood around a small fire that they had made, praying and singing. They had gone into the local draft board office and taken 378 draft records for the young men in the 1-A category, who were most likely to get drafted to go to war in Vietnam. They set fire to the draft records using homemade napalm, made from gasoline and laundry soap, to symbolize the U.S. military’s use of napalm on Vietnamese civilians. They became known as the Catonsville Nine. Video of the act of civil disobedience was seen around the world. I want to turn to the 2012 documentary Hit & Stay, which chronicles the stories of the activists, including Fathers Phil and Dan Berrigan. AMY GOODMAN: The Catonsville Nine were prosecuted and, in 1970, given prison sentences of up to three years behind bars. Earlier this month, a ceremony was held in Catonsville, Maryland, to mark the unveiling of a new historical marker to commemorate the action. I spoke to Margarita Melville. She’s one of the last surviving members of the Catonsville Nine. MARGARITA MELVILLE: This is the—the Knights of Columbus rented out the second floor to a Selective Service registration office. MARGARITA MELVILLE: Well, somebody had cased it out for us, because, I mean, Tom and I had just gotten back to this country from Guatemala and Mexico. So, somebody had cased it out, and we thought it was very—they looked for a place where it would be safe to run down, that we could get out quickly, and that we had a place to burn them that was nearby. So we ran up—but I can’t find—I can’t remember exactly where the stairway was. I remember rushing down the stairway. And then we stood here. It wasn’t paved, so it was just dirt, and it was easy to put out the fire afterwards, you know, once everything was burned. MARGARITA MELVILLE: The files out of the—this was before computers. So there was only one copy of each file. MARGARITA MELVILLE: These were the A-1 draft files, not just the draft files. Those who had 4-A, or whatever the other categories were, were not affected. I just met two men who were deferred because they were in school. And they said, “Why didn’t you burn ours?” One of them had to go and serve two years after he got out of school. We got as many as we could. We put them in baskets. Mary and I kept the two women clerks from stopping us. I kept in—they were ready to tackle us. MARGARITA MELVILLE: I kept—I stood in front of one. There were two. And Mary in front of the other one. If they wanted to use the phone, we—fine, call the police. But we—that was not our interest, because we were going to get finished before they got here. MARGARITA MELVILLE: No, no, no, no, in the middle of the parking area. We circled it and burned the files. And when—Tom, my husband, was very sure that every last file was out of the basket, so none got left tucked in there. And so, we burned them all, kicked the can or the basket around. It was a wire basket. And so, we each threw in a match, and we were able to burn them all right there. MARGARITA MELVILLE: Tom and John and I had been missionaries in Guatemala, where we had seen Green Berets beginning to work with the Guatemalan army and teaching them how to use napalm. Later on, they taught them how to do strategic villages. Andthey had the pattern down. MARGARITA MELVILLE: Napalm. That was—the recipe was in the Special Forces handbook: soapsuds, suds, in those days, like Ivory soapsuds, and gasoline. MARGARITA MELVILLE: Because the Knights of Columbus—there’s no Selective Service office anymore—they just weren’t happy with the idea of that kind ofa marker on their property. AMY GOODMAN: That’s Margarita Melville, speaking earlier this month in Catonsville, Maryland, where a marker was dedicated to the Catonsville Nine action 50 years ago today. The late Father Dan Berrigan once wrote—the late Father Dan Berrigan once wrote about this action. He wrote—this is what he had to say about the Catonsville action, when I interviewed him. He said, “Our apologies, good friends, for the fracture of good order, the burning of paper instead of children.” I interviewed him in 2006 and asked him how he came to be involved in the Catonsville action and why he went underground after his trial. FATHER DANIEL BERRIGAN: Philip came up. He was awaiting sentencing for a prior action in '67 in Baltimore, where they poured their blood on draft files in the city. And he came up to Cornell and announced to me, very coolly, that he and others were going to do it again. I was blown away by the courage, and the effrontery, really, of my brother, in not really just submitting to the prior conviction, but saying, “We've got to underscore the first action with another one.” And he says, “You’re invited.” So I swallowed hard and said, “Give me a few days. I want to talk about pros and cons of doing a thing like this.” And so, when I started meditating and putting down reasons to do it and reasons not to do it, it became quite clear that the option and the invitation were outweighing everything else and that I had to go ahead with him. So I notified him that I was in. And we did it. FATHER DANIEL BERRIGAN: No, I had been at the Pentagon in ’67 in—I think it was in October. And a great number of us were arrested after a warning from McNamara to disperse. And we spent a couple of weeks in jail. It was rather rough. And we did a fast. And we were in the D.C. jail, which was a very mixed lot. So I had had a little bit of a taste during that prior year. FATHER DANIEL BERRIGAN: Yes. I met him at a social evening with the Kennedys in about '65 and after this very posh dinner, which was welcoming me home from Latin America. One of the Kennedys announced that they would love to have a discussion between the secretary of war and myself in front of everybody, which we did start. And they asked me to initiate the thing, and I said to the secretary something about, “Since you didn't stop the war this morning, I wonder if you’d do it this evening.” So he looked kind of past my left ear and said, “Well, I’ll just say this to Father Berrigan and everybody: Vietnam is like Mississippi. If they won’t obey the law, you send the troops in.” And he stopped. And the next morning, when I returned to New York City, I said to a secretary at a magazine we were publishing—I said, “Would you please take this down in shorthand? Because in two weeks I won’t believe that I heard what I heard. The secretary said, in response to my request to stop the war, quote, 'Vietnam is like Mississippi: If they won't obey the law, you send the troops in.’” And this was supposed to be the brightest of the bright, one of the whiz kids, respected by all in the Cabinet, etc., etc., etc. And he talks like a sheriff out of Selma, Alabama. Whose law? Won’t obey whose law? Well, that was the level at which the war was being fought. AMY GOODMAN: After the trial, you went underground. Why did you decide to do that? FATHER DANIEL BERRIGAN: Well, the war had worsened, and the spring of '70, the campuses were aflame. Nixon had invaded Laos. There was secret bombing going on. The war had widened. It was a bad time to turn oneself in, and we were comparing that order to military induction. It was like saying, “Well, I'm going off to war. I’m going to obey them and go off to war. I’m going to take the penalty for what we did to make the war evidently, evidently unwinnable and unwageable. So, a group of us said, “No go,” and went underground. FATHER DANIEL BERRIGAN: Well, it meant that the FBI was on your tail and that Hoover was outraged and very angry and kept marking up sheets—that we got out, Freedom of Information, later—saying, “Get him! Get him!” and scrawling all these orders around and putting extra people on our tail. AMY GOODMAN: That’s Father Dan Berrigan, speaking in 2006. The Catonsville action inspired hundreds of other actions at draft boards across the United States. It also led to a global protest effort to end the threat of nuclear war, known as the Plowshares movement. In 1980, Dan Berrigan, again with his brother Phil and others, broke into a General Electric nuclear missile plant in King of Prussia, Pennsylvania, in the first Plowshares action. The most recent Plowshares action took place on April 4th, the 50th anniversary of Dr. Martin Luther King’s assassination, when seven Catholic Plowshares activists entered the Kings Bay Naval Base, the largest nuclear submarine base in the world, in Georgia. They were armed with just hammers, crime tape and baby bottles containing their own blood. The seven have been locked up since they were arrested. One of the seven is Elizabeth McAlister, the widow of Philip Berrigan, a priest at the time he led the Catonsville action 50 years ago today. This is Democracy Now! Back in a minute.